"Don't Stop Believing" redirects here. For the Singapore TV series, see Don't Stop Believin' (TV series). For other uses, see Don't Stop Believing (disambiguation). "Don't Stop Believin'" is a song by the American rock band Journey, originally released as a single from its seventh studio album Escape (1981). It became a number 9 hit on the Billboard Hot 100 on its original release. In the United Kingdom, the song was not a Top 40 hit on its original release; however, it reached sixth with a 2009 re-release after it had increased its popularity from its use on television. The song is played in the key of E major at a tempo of 118 beats per minute. The vocal range is E3–C#5. The chord progression, played by the piano in the introduction and continued throughout most of the song, is eight chords long, following a I-V-vi-IV-I-V-iii-IV progression. While the lyrics mention being "born and raised in south Detroit", the area that would be considered south Detroit is actually the Canadian city of Windsor. Steve Perry has said, "I tried north Detroit, I tried east and west and it didn't sing, but south Detroit sounded so beautiful. I loved the way it sounded, only to find out later it's actually Canada." In 2007, the song gained press coverage and a sharp growth in popularity for its use in the famous final scene of HBO's The Sopranos series finale "Made in America." Steve Perry was initially hesitant to allow the song to be used in The Sopranos but later agreed. Digital downloads of the song soared following the episode's airing and the exposure motivated the band members to overcome the struggles they were having at the time and find a replacement lead singer after Perry's departure. The song was released as downloadable content for the music video game series Rock Band on March 31, 2009. The song is referred to in the chorus of the song "This'll Be My Year" performed by Train on their album California 37, in which Pat Monahan sings "I stopped believin', although Journey told me 'don't'". The song has been a rallying cry for a multitude of sports teams, first by the Chicago White Sox in their successful run to the 2005 World Series, when catcher A. J. Pierzynski and teammates heard the song being sung in a bar in Baltimore. The White Sox invited Journey lead singer Steve Perry to the team's celebration rally, where he sang the song along with several members of the team. In 2008, in a tight battle for first place with the Arizona Diamondbacks in the National League West, the Los Angeles Dodgers began to play "Don't Stop Believin'" in the middle of the 8th inning at all of their home games. Subsequently, the song was played at Dodger home games throughout the 2009 season, much to the chagrin of Perry, a self-proclaimed San Francisco Giants fan. The song also became the unofficial anthem for the Giants' 2010 postseason, especially after local musician Ashkon created a parody version of the song following their winning the 2010 National League West Division. The song was used during the end montage following the Fox network's coverage of the 2010 World Series, which was won by the Giants. Perry appeared in the Giants' subsequent victory parade, and the song was played at the start of the Giants' victory rally. Perry has appeared at several Giants home games at AT&T Park during the 2014 postseason, leading the crowd in singing "Don't Stop Believin'" during the "8th inning sing-along" when the Giants are tied or behind in the score; when the Giants are ahead the crowd sings "Lights" instead. The song has for years been commonly played at Detroit Red Wings hockey games; at Red Wings home games (especially during the last minutes of playoff victories), the recording is turned down during the line "born and raised in south Detroit" so the home fans can sing the line from the song. It is also used at numerous Detroit sporting events. Prior to the beginning of the 2014 season Mississippi State Head Football Coach Dan Mullen asked the DJ at Davis Wade Stadium to play "Don't Stop Believin" between the third and fourth quarters of each Bulldog home game. MSU fans immediately took to the song and began to sway and ring the cowbells that they traditionally bring to home games in sync with the beat while singing along. The song reached number eight on Billboard's Mainstream Rock chart, and number nine on the Billboard Hot 100 chart. It sold over a million copies in vinyl. It topped downloads in the iTunes Music Store amongst songs not released in the 21st century, and was also the 72nd most downloaded song of 2008, and 84th most downloaded song of 2009 in the store, over 27 years after its release. On 31 August 2009 the song topped the 3 million mark in paid downloads. It is the best-selling digital song from a pre-digital-era, and it was also the best-selling rock song in digital history until it was over taken by Imagine Dragons' "Radioactive" in January 2014. It was placed just outside the top twenty best selling digital songs of all time in September 2010. It has sold over 6.8 million digital units in the US as of September 2016 and is the best selling digital track recorded in the 1980s. "Don't Stop Believin'" has entered other charts across the world in recent years, following a gain in popularity. In Canada the song peaked at number 2, at number 4 in Ireland, at 25 in Sweden after many chart runs, and at number 50 in the Dutch charts. The song is one of the most popular rock tracks in Ireland and continues to remain in the top ten most downloaded songs. The song was released in the United Kingdom in December 1981 and peaked only at number 62. 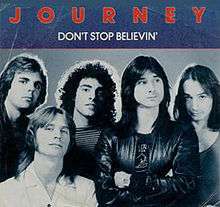 "Don't Stop Believin'", never re-released in the UK, retained a cult following and re-entered the UK Singles Chart in February 2009 at number 94, due to digital downloads. On November 1, 2009, following a performance on The X Factor, "Don't Stop Believin'" re-entered the chart at number 52, and it rose to number 19 a week later. The song stayed in the charts for three weeks, before dropping out of the top 40. On December 20 that year, "Don't Stop Believin'" re-entered the chart at number 9 after the song was performed again on The X Factor. The song remained in the top 10 for another seven weeks in 2010, hitting a peak of number 6 in the process. In early 2010, it was announced that the song had been the 65th best-selling single of 2009. "Don't Stop Believin'" spent a total of 21 non-consecutive weeks in the top 40 during its November 2009 – April 2010 run. 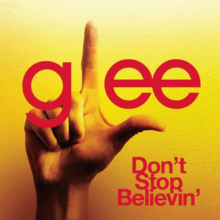 "Don't Stop Believin'" was the 25th best-selling track of 2010, selling just over 435,000 copies. It re-entered the charts in 2011, 2012 and 2013 and to date has spent 95 weeks in the top 100. In September 2014, the Official Charts Company listed the song as having sold a Million copies in the UK. In December 2010, The Key of Awesome had sampled the chorus of "Don't Stop Believin'", as part of their Black Eyed Peas spoof. However, in October 2011, the members of Journey had the original video taken down due to the copyright infringements. The Finnish symphonic metal band Northern Kings covers the song on their album Reborn. The 2007 "covers" album Guilt by Association Vol. 1 contains an a cappella version of "Don't Stop Believin'" by Petra Haden (member of That Dog and daughter of jazz bassist Charlie Haden) recorded via multiple vocal overdubs. Alvin and the Chipmunks recorded a cover version for their 2008 album Undeniable. Glam metal band Steel Panther released a cover version as a non-album single in 2009. In 2009, Joe McElderry performed the song on the 6th UK series of The X Factor on week 4, and again in the finals. This helped the original version get back in the UK charts in the second half of 2009. The song was one of the choices to be the series' winner single, but Journey did not like the arrangement of The X Factor version. "The Climb" by Miley Cyrus was eventually chosen. McElderry still frequently performs the song in his live shows, occasionally changing the lyrics, "born and raised in South Detroit" to "born and raised in South Shields." The housemates of Big Brother 2010 recorded a version of the song, coached by Andrew Stone of Pineapple Dance Studios, in July 2010. Stone also choreographed and shot a video of the performance. According to Digital Spy, the video "almost out-Glees Glee" Steve and Rachel sang the lead vocals. On May 17, 2013 singer Fatin Shidqia along with Novita Dewi performed this song during the Grand Final of X Factor Indonesia. Hungarian band Jumprockers made a cover of the song, in the style of jumpstyle in 2013. This version kept the original vocals but a brand new guitar solo part was recorded. In 2014 German DJ Higheffect released ten cover versions with Portuguese singer Silvia Dias as the leading voice. MP3 Seller Musicload categorized it Dancepop. On the 2009 compilation album Rock of Ages, Starship, formed from Jefferson Starship, covered this song. This should not be confused with the soundtrack to the film Rock of Ages. "Don't Stop Believin'" was recorded by the cast of American television series, Glee. It is the first single released from the soundtrack of the series, Glee: The Music, Volume 1 and was performed on the first episode of the initial season, "Pilot". A portion of the song was covered again in the episode "The Rhodes Not Taken". A second version was covered by the cast in the first season's finale episode, "Journey to Regionals", for the glee club's Regionals competition; it is included in the EP soundtrack, Glee: The Music, Journey to Regionals. A third version was covered by Lea Michele as Rachel Berry in the nineteenth episode of the fourth season of the show, "Sweet Dreams"; it was released as a single April 23, 2013. A fourth version was performed in the 2014 episode "New Directions". The Glee arrangement was adapted from Petra Haden's version. The "Regionals Version" earned a nomination for Grammy Award for Best Pop Performance by a Duo or Group with Vocals for the 2011 ceremony. Released as a digital download on June 2, 2009, the song performed well in the United States, Ireland, the United Kingdom and Australia, where it charted within the top five of their national charts. The cast performance of "Don't Stop Believin'" was certified gold in the US in October 2009 and platinum in March 2011, achieving over 1,000,000 digital sales, and platinum in Australia, with sales of over 70,000. It remains the most popular recording in the show's history, having sold 1,422,000 copies in the United States alone. "Don't Stop Believin'" was put on the BBC Radio 1 and BBC Radio 2 playlists in the UK in January 2010. Aly Semigan of Entertainment Weekly critically praised the song stating "Fox's Glee put the ultimate earworm back in its rightful place." She then continued saying "even if you aren't one for show choirs (which, is quite frankly, shocking), it's pretty damn hard to resist." Semigan also compared it to the original version stating "it sounds slightly different in this Freaks and Geeks meets High School Musical pilot, but it's a good kind of different." "Any Way You Want It" / "Lovin', Touchin', Squeezin'"
The Almighty Glee Club did their remix version including a radio edit, club mix, dub mix and instrumental. Pop-Punk band All Time Low performed a cover of this during several live concerts, and was featured once in a special of their straight-to-DVD concert video. In the United States, the song debuted at No. 4 on the Billboard Hot 100 on week dated June 6, 2009 with sales of 177,000 copies in its first week, behind Black Eyed Peas's "Boom Boom Pow", Lady Gaga's "Poker Face" and Jamie Foxx's "Blame It", respectively the number one, number two and number three on the chart. The song received certification Platinum by RIAA for more 1.4 million copies of digital sold which is also their best-selling song to date. Glee Cast performing the song during Glee Live! In Concert! "Don't Stop Believin'" was part of the setlist of Glee Cast's worldwide 2010/11 concert tour, Glee Live! In Concert! tour. On April 7, 2010, Glee Cast performed the song on the The Oprah Winfrey Show. On April 13, 2010, Glee Cast performed the song on the 2010 White House Easter Egg Roll, along with "National Anthem", "True Colors", "Somebody to Love", "Over the Rainbow", "Home" and "Sweet Caroline". On December 5, 2010, Glee Cast performed the song on the UK version of the The X Factor. 1 2 3 Strong, M. C. (1995). The Great Rock Discography. Edinburgh: Canongate Books Ltd. p. 443. ISBN 0-86241-385-0. 1 2 3 Paul Grein (January 2, 2014). "Can You Believe "Don't Stop Believin'" Loses Spot as Best-Selling Rock Song?". Chart Watch. Yahoo. ↑ Flans, Robyn (1 June 2007). "Classic Tracks: Journey's "Don't Stop Believin'"". Mix Magazine. ↑ "Journey: Don't Stop Believin' Sheet Music". sheetmusicdirect.com. Weed High Nightmare Music/Lacey Boulevard Music, USA. 1 2 "Journey song cements status as cultural touchstone". CBC News. 20 July 2009. Retrieved 14 January 2012. ↑ "Free Services for PR :: News :: Press Releases". pr-inside.com. ↑ "Journey song achieves digital landmark". theguardian.com. 2008-11-11. Retrieved 2013-10-19. ↑ "Journey Members Reflect on Importance of 'Sopranos' and 'Glee,' Talk PBS Doc". hollywoodreporter.com. 2013-08-06. Retrieved 2013-10-19. ↑ "Rock Band Gets 'Don't Stop Believin' as DLC". Shacknews. ↑ "This'Ll Be My Year Lyrics - Train". Sing365.com. Retrieved 2014-04-21. ↑ "Train - This'Ll Be My Year Lyrics". Directlyrics.com. Retrieved 2014-04-21. 1 2 Henry Schulman (2009-09-15). "Perry's 8th-inning Journey". SFGate.com. Heart Communications. Retrieved 2009-09-26. ↑ Joe Eskenazi (2010-10-11). "'Don't Stop Believing' Finally Giants' Anthem". SF Weekly. Retrieved 2010-11-04. ↑ "Live Blog of the San Francisco Giants' Victory Parade". KQED. 2010-11-03. Retrieved 2012-01-05. ↑ Labrecque, Jeff (17 October 2014). "Giants victory extends Steve Perry's concert stand for at least two more dates". Entertainment Weekly. Retrieved 20 October 2014. ↑ Jeff Z. Klein (2009-06-01). "At the Joe, Detroiters Sing "Don't Stop Believin'"". The New York Times. Retrieved 2009-12-11. ↑ Rick Paulas (2009-09-01). "A smell of wine and cheap perfume". ESPN. Retrieved 2010-01-22. ↑ Chris Willman (2009-06-29). "Don't Stop Believin as pop-cultural touchstone". Los Angeles Times. Retrieved 2010-09-06. ↑ "Power Poll: Mississippi State, Ole Miss take over top two spots". CBSSports.com. ↑ Andy Staples. "Mississippi State beats Auburn 38-23 to continue hot start in SEC West". SI.com. ↑ "Don't Stop Believin' (In Mississippi State) - Campus Sports Net". Campus Sports Net. ↑ "Journey hit has MSU fans 'Believin' to start every fourth quarter". cdispatch.com. ↑ Legacy Recordings. "Legacy". Sony Legacy. ↑ Paul Grein. "Week Ending Aug. 23, 2009: Over 50 And Still On Top". Yahoo Chart Watch. ↑ Goldstein, Sjarif (2012-12-07). "Journey returns to Honolulu". Honolulu Star-Advertiser. Retrieved 2013-02-12. ↑ Grein, Paul (2010-09-22). "Week Ending Sept. 19, 2010: "It Goes On And On And On And On"". Yahoo!. Retrieved 2009-09-23. 1 2 Caufield, Keith (September 12, 2016). "Rewinding the Charts: In 1981, Journey Didn't 'Stop' on Its Way to No. 1". Billboard Magazine. Retrieved September 12, 2016. ↑ "Journey". Official Charts Company. Retrieved 5 January 2016. ↑ "Now That's What I Call A Million tracklisting revealed!". officialcharts.com. ↑ "Swedishcharts.com – Journey – Don't Stop Believin'". Singles Top 100. Retrieved 20 February 2011. ↑ "Archive Chart: 2010-01-10" UK Singles Chart. ↑ Archived September 18, 2012, at the Wayback Machine. ↑ "Charts Plus Year end 2009" (PDF). Charts Plus. Retrieved 2010-07-19. ↑ European Hot 100. Billboard. 1 2 "2010 Year-end UK Singles". BBC (BBC Online). 2010-12-26. Retrieved 2010-12-26. ↑ "BEST OF ALL TIME - SINGLES". swedishcharts.com. Retrieved 7 September 2015. ↑ "Top 100 Downloads of All Time". BBC. 2 January 2011. Retrieved 11 October 2011. ↑ "Certificaciones – Journey" (in Spanish). Asociación Mexicana de Productores de Fonogramas y Videogramas. ↑ Grein, Paul (March 26, 2014). "Chart Watch: Two Movie Songs In Top 5". Yahoo Music. Retrieved March 30, 2014. ↑ "YouTube". YouTube. Retrieved 2014-04-21. ↑ Barely Political. "YouTube". YouTube. Retrieved 2014-04-21. ↑ The Key of Awesome! : Moves Like Jagger Comments! on YouTube Event occurs at time 3:55. ↑ "Undeniable". Amazon.com. Retrieved 2012-09-05. ↑ STARS DON’T STOP BELIEVIN’ IN X FACTOR CHART BOOST MUZU.TV. ↑ Nov 26, 2009 16:09 (2009-11-26). "X Factor: Simon Cowell 'may choose Joe McElderry's Don't Stop Believin' as winner's single' - 3am & Mirror Online". Mirror.co.uk. Retrieved 2014-04-21. ↑ Tom Eames (July 21, 2010). "Stone teaches 'Don't Stop Believin". Digital Spy. Retrieved 24 September 2010. ↑ Alex Fletcher (July 23, 2010). "Video: BB11 'Don't Stop Believing'". Digital Spy. Retrieved 24 September 2010. ↑ Syahrial Mayus (18 May 2013). "Antara Fatin atau Novita? Pendukung Asal Sumut Mungkin akan Bingung" [Fatin or Novita? Support from North Sumatra must be confused]. jaringnews.com (in Indonesian). Retrieved 20 August 2013. ↑ mix1.de Redaktion. "DJ Higheffect feat. Silvia Dias mit 'Don't Stop Believin". mix1.de. ↑ "Pilot". 20th Century Fox. fox.com. Retrieved 2013-06-07. ↑ Goldberg, Lesley (February 24, 2014). "Glee's 100th Episode Song List Revealed". The Hollywood Reporter. Retrieved March 2, 2014. ↑ "Glee Cast Glee: The Music, Volume 1 Review". BBC. 11 Feb 2010. Retrieved 2010-02-11. ↑ "RIAA Gold & Platinum". Recording Industry Association of America. Retrieved July 15, 2011. ↑ "ARIA Charts - Accreditations - 2010 Singles". Australian Recording Industry Association. June 30, 2010. Retrieved July 18, 2010. ↑ "'Glee' Cast's 10 Best-Selling Downloads". Billboard. Prometheus Global Media. March 20, 2015. Retrieved March 20, 2015. ↑ Semigan, Aly (May 21, 2009). "'Glee' propels Journey's "Don't Stop Believin'" to go on and on and on and on". Entertainment Weekly. music-mix.ew.com. Retrieved 2009-10-01. ↑ "Glee Cast -Don't Stop Believin' - Amazon.com". ↑ "Glee Cast - Don't Stop Believin'- Amazon.de". ↑ "Black Eyed Peas - Boom Boom Pow". Billboard. Nielsen Business Media, Inc. 2009-06-06. Retrieved 2009-06-05. 1 2 Gary Trust (March 20, 2015). "'Glee' Graduates at the Head of the Class on Billboard Hot 100". Billboard. Retrieved March 21, 2015. ↑ "Australian-charts.com – Glee Cast – Don't Stop Believin'". ARIA Top 50 Singles. ↑ "Charts.org.nz – Glee Cast – Don't Stop Believin'". Top 40 Singles. ↑ "Glee – Chart history" Billboard Hot 100 for Glee. ↑ "Glee > Charts & Awards > Billboard Singles". AllMusic. Retrieved July 17, 2010. ↑ "Glee – Chart history" Canadian Hot 100 for Glee. ↑ "Chart Track: Week 2, 2010". Irish Singles Chart. ↑ "Dutchcharts.nl – Glee Cast – Don't Stop Believin'" (in Dutch). Single Top 100. Retrieved January 28, 2011. ↑ "Archive Chart: 2010-01-24". Scottish Singles Top 40. Retrieved 24 January 2010. ↑ "Archive Chart: 2010-01-31" UK Singles Chart. Retrieved 31 January 2010. ↑ "Austriancharts.at – Glee Cast – Don't Stop Believin'" (in German). Ö3 Austria Top 40. Retrieved January 28, 2011. ↑ "Classement officiel des ventes de singles & titres en France du 28 mars au 03 avril 2011". SNEP (in French). SNEP. April 8, 2011. Retrieved April 4, 2011. ↑ "Musicline.de – Glee Cast Single-Chartverfolgung" (in German). Media Control Charts. PhonoNet GmbH. Retrieved February 16, 2011. ↑ "Adult Contemporary Airplay". Billboard—Japan. Prometheus Global Media. January 24, 2011. Retrieved November 24, 2013. ↑ "Swisscharts.com – Glee Cast – Don't Stop Believin'". Swiss Singles Chart. Retrieved January 28, 2011. ↑ "European Hot 100". Billboard.com. 2010-12-31. Retrieved 2012-01-05.